Mbale, Sipi Falls and Mount Elgon. Info for independent travellers. If you are planning a budget trip in Uganda, here you can find useful information to visit Mbale and Sipi Falls and surroundings, in a independent and low-cost trip. You have to pass Mbale to go to Sipi and Mt Elgon National Park. If you have time, the surroundings are nice enough to make a pleasant stop. Cliffs and waterfalls too, it´s also the lower slopes of Mount Elgon!You can just walk from Mbale center. No tourists around. The town´s center is just a few streets, with old colonial houses. As reference, the clock Tower is at Kumi Rd & Republic Rd. The town is under works (april 2015), so expect dust. Transport in Mbale has different locations depending of the destination. The bus station is close to the market if heading to Kenya´s border (Tororo and Busia or further Nairobi) and to Kampala. Vans stops all around. Ask local people, they are friendly. Van,10.000 sh, 3 h (so stops in 150 km). Taxis & vans to Sipi and Mount Elgon area, are around Kumi rd, going up and down looking for passengers. Just a few go directly there. Maybe you will have to transfer, as some vehicles just go til the lower junction 40 km from Mbale on the Mbale-Moroto Rd (then it´s just 10 km up to Sipi), but don´t worry as they are many shared taxi-cars going up and down. Around 1 hour. Local price is 5.000 sh (3.000 to the junction + 2.000 to Sipi). They will try to charge you 10.000 sh, double price, “mzungu” price, this is what you will see on the borads of the tourist camps in Sipi too. Easy extra commission! Try to agree about the price in advance and just pay once you get there. This is an exception in Uganda, usually they don´t try to charge you extra... but this is Sipi! From Mbale to Sipi, finally we paid 7.000 sh/pp, and the way back we paid 5.000 sh because we took a private car and negociate the local price. Bus, 4.000 sh, 1 h. Also vans (maybe a bit more expensive). The road Mbale-Tororo is tarred, in very good conditions. Price for transport Tororo - Malaba (Kenya border): 2.000 sh, shared car. Also boda-bodas. Most of the heavy traffic uses the Malaba border, it´s the main Kampala-Nairobi road. Now new road Jinja-Iganga-Busia- Malaba, tarred and good. So the heavy traffic doesn´t cross Tororo. The Busia border (Kampala-Kisumo Lake Victoria) is less crowded. A few cheap guesthouses in the center, most of them on Naboa St. (just one street down the clock tower). Also more expensive hotels in the surroundings, most of them east of Replublic St.
Masaba Top Motel: where we stayed, 25.000 sh for a self-contained room (3/4 bed), with TV and hot shower. Clean, quite calm (most of the rooms are inside a covered yard). 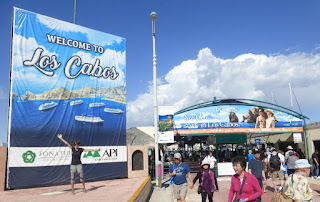 Quality - price is OK.
It´s the main town of the area, so you find banks (Republic st.), pharmacies, internet shops, etc. The Mount Elgon NP office (UWA) is in Mbale, east of the center, in the suburbs, follow Republic st., the office is just before Mount Elgon Hotel. The staff is not very polite. For food, a few local restaurants on Naboa Street, quite clean and really cheap. In the back street between Naboa and Republic, BBQ, chips and chapattis in the evenings. Easy to find supermarkets and shops and the big market building in the center. Wanale Ridge (2.348 m), a finger extending from the main massif of Mount Elgon, southwest. Beautiful cliffs on the Mbale side and waterfalls (at least 3 in the rainy season). Weather is hot in Mbale as you are in the plain. Walking distance from Mbale center, to reach the lower cliff and see the falls from closer. Just walk to Moni area, continue on Republic street passing UWA office and Mount Elgon. You can do a loop, many houses, fields and tracks. Coffee and banana plantations. Friendly people around, no tourists! In the lower slopes of Mount Elgon, you will see cliffs, waterfalls, rural life, and a huge flat plain. Beautiful views! But hard to see Mount Elgon summit. Sipi is famous for its 3 waterfalls, falling over the cliffs. It´s a tourist spot in northern Uganda, not too far from Kenya´s border. So expect to find many local guides around the falls looking for your money offering their services. Tourist price too with transport Mbale-Sipi: drivers will try to charge you double price. Be patient, the place is really beautiful and quiet, and fortunatly Uganda people are nice and you can still enjoy a lot around Sipi! Sipi is a small village on the edge of a cliff, outside Mount Elgon National Park (no fees). But no surrounded by mountains and hills, no. Just cliffs. It lies at around 1.800 m so the weather is cool, specially at night, mornings can be foggy. Just 50 km west of Mbale, with a tarred road. Kapchorwa (the main village in Mount Elgon area) is 14 km up from Sipi, tarred road. Mount Elgon doesn´t look like a volcano even if it´s one. You will see cliffs, waterfalls, hills, emerging from a flat and hot plain, from Mbale area. Hard to see the top, lot of clouds. Note: too many guides around Sipi! Around the lodges, they all want to be your guide, “book” your transport (charging you double), help you, "easy money"…We don´t like this harassment, around lodges and falls. Fortunatly it´s the only place in Uganda where we found that! There are 3 cheap camps, all walking distance, just close to the road and village, on the edge of the cliff with waterfall views. Crow´s Nest and Twalight are together, entering the village and then passing it Moses´Campsite. All similar concept, quiet and good views, the difference is the electricity and hot shower. We recomend check before to choose, as we did. - Banda with shared WC: 20.000 sh/pp (we got 15.000 sh/pp, low season price). - Self-contained double room: 80.000 sh, (low season: 60.000 sh). The bandas are dormitory style (most have 4 beds) but normally you will not share with more people, electricity only in the reception-main area but they provide kerosene lights. Hot shower on request, with firewood. Nice views of the falls, the bandas are just on the edge of the cliff. They said there was free coffee and bananas (like in Crow´s Nest) but the staff was missing, and didn´t give anything. Moses´Campsite: (map, number 3). Camping (10.000 Sh/pp) and bandas (20.000 sh/pp). Bandas are small and wet, no electricity, no hot shower. Crow´s Nest: (number 1 in the map). More expensive. Shared WC, the bandas have electricity, breakfast included and hot shower. Also self-contained rooms. This camp is very popular in all the guide-books. But we found the staff quite arrogant. 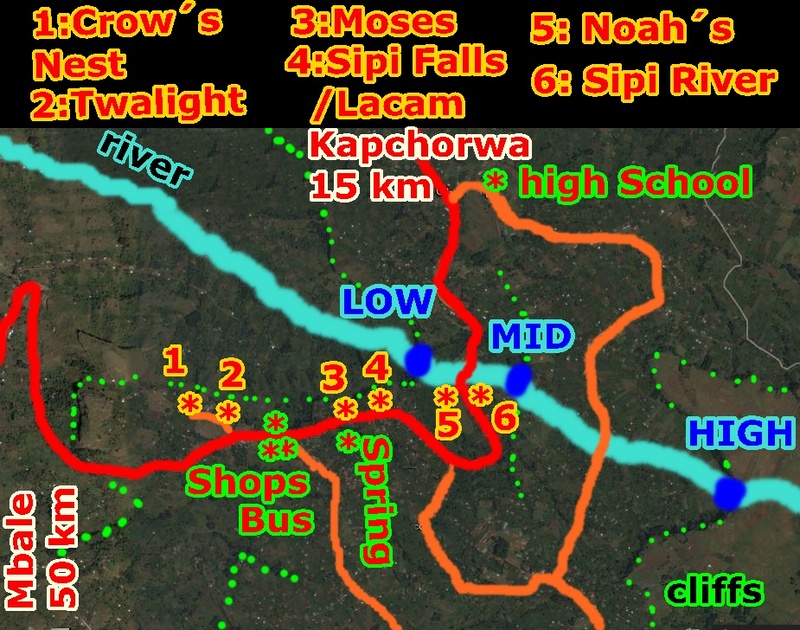 The other lodges in the Sipi area are expensive: Lacam, Sipi Falls Resort, Noah´s Ark Spa, Sipi River Lodge. Prices for bandas, around 90.000 - 100.000 Sh/pp and much more, B&B, even some with shared WC. Views are much better from the cheapest camps! Sipi Tourist Restaurant: local menu, local prices. A few simple local restaurants in Sipi village. Our favourite was Sipi Tourist Restaurant, nice staff, cheap food, just on the right going up. There´s a spring where you can drink water, just up the village on the right, on the main road, just down a wooden bridge. The original “Aqua Sipi” and it´s free! The camps also offer food, but the prices and menu are for tourists. It´s just a small village, no banks (bring enough cash). Kapchorwa, 14 km up the road, is bigger. If not, you find everything in Mbale (50 km away). Sipi has 3 waterfalls, falling over the cliffs. The most beautiful waterfall is the lowest one, over a cave in the cliff and the plain views down. From the “cheap” lodges you have the best views of the area. You can also see the highest fall from the lodges but far away. 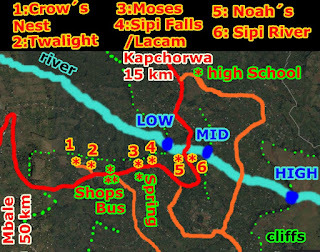 The second or mid fall is over the main road, just 2 km passing the village, behind Sipi River Lodge and other expensive lodges area. The fall is quite small, there´s a path on the left side but we didn´t go that way as many “guides” around… Small river between the falls. Guides around Sipi: too many! Community tour offices, guys in front of the lodges, near the falls (specially mid fall). And all the “mzungus” seem to take a guide… Feel free to decide! Negotiate if you want a guide! The guides charge around 15.000-25.000 sh/pp (we really find it´s quite expensive), depending on the route and hours walking, telling you there are entrance fees to the falls and property passes included. It´s really easy to walk alone around! Up to you! You don´t really need a guide. They say you have to, but it´s not true, you can walk alone, it´s not a private reserve and you don´t have to cross a private property! From the main tarred road, you can see the 3 waterfalls, the cliffs and get orientated. And there are roads and paths and houses and people everywhere. Don´t think you are in a wild area where you will get lost! Just don´t approach too much the falls and you will see no guides... You will also enjoy, free! Local people are friendly! Walk around Sipi! It´s what we did! 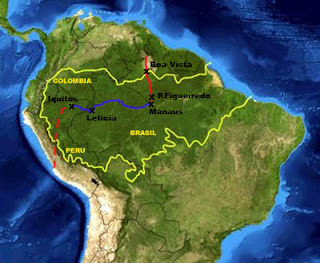 The area is really beautiful, not only the falls, also cliffs, infinite plain views, fields (coffee, bananas, corn), rural life. Roads and tracks zig-zag over the cliffs. A populated area, on the lowest slopes of Mount Elgon. You can go up via the gravel road (now getting repared, after passing the village and police station) to the school and then go down to the main tarred road near the secondary high school. Nice loop, around 6 km. Look at our map. Take a boda-boda if you don´t feel like walking. The driver will do the loop around (following the main tarred road and the "orange road" on our map). Negotiate too, we asked and said it´s around 10.000 sh/pp maximum. Next destination from Sipi was Kenya. We asked for the route options. The road Mbale-Sipi-Kapchorwa is tarred (many potholes in the flat area).After Kapchorwa, it´s a dirty road continuing to Suam, a small Kenya´s border, over the mountain (around 130 km from Sipi). Maybe one day they do a new tarred road. They didn´t recommend us that long way. Finally, we went back to Mbale and passed to Kenya via Tororo border (around 120 km from Sipi), with a good tarred road. In total, around 3 hours from Sipi and 11.000 sh/pp. A solitary volcanic mountain (4.321 m), on the border of eastern Uganda and western Kenya. Called Masaba by local people. The highest slopes are national parks in both countries (fees, 35 $ in Uganda and 30 $ in Kenya). The lowest slopes are populated, with many villages and coffee-banana plantations. Climbing Mount Elgon: NOT CHEAP! Price for hiking is 90$/pp/day (fees+guide). Guides are compulsory. Different trails, different durations. But at least 360 $ only in fees! From Budadiri (Sasa trail, 4 days return); from Kapkwai-Forest Exploration Center, 10 km up from Sipi (Sipi Trail, 7 days return); from Kapkwata (Piswa Trail, 6 days return). UWA huts in the mountain. Public transport to main villages around and always boda-bodas in the area. It´s an all year round destination but june-august and december-march are the driest and best months. 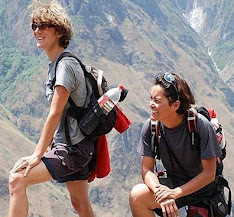 If planning to climb the mountain or just visiting other areas around, you will also find accommodation. But not many cheap options! In Kapchorwa, a few lodges, some quite expensive. In Budadiri, Wagagai Hotel and Rose´s Last Chance. Sisyi Falls (half way from the main Mbale-Sipi road, you see the waterfall from the main road and a second one on the left), Garden of Eden (quite expensive, even camping). Tororo is a small town, just 10 km from Malaba- Kenya´s crowded border. Nothing to do here (just a rock to climb), just a stop near Kenya (better than staying at Malaba). The main road is out of town, so the heavy traffic doesn´t cross Tororo´s center. Mbale - Tororo: bus, 4.000 sh, 1 h. Also vans (maybe a bit more expensive). Tororo - Malaba (Kenya´s border): 2.000 sh, shared car. Also boda-bodas. Kampala, Busia, etc. : buses from Tororo. Note: Most of the heavy traffic uses the Malaba border, it´s the main Kampala-Nairobi road. Now new road Jinja-Iganga-Busia, tarred and good. The Busia border (Kampala-Kisumo Lake Victoria) is less crowded. There are a few lodges in town, some are too basic and other ones try to charge too much. Ramada Guesthouse: where we stayed, 30.000 Sh, self-contained double room. New, very clean. Nice staff. Ask for a room inside the yard as there are pubs outside on the street and it´s loud music at night til late. The location is on the street at the roundabout, opposite to the rock side. Gateway guesthouse: it´s cheaper (20.000 sh, self-contained room) and OK, but the rooms have no key to lock! Ask first. It´s just on the street near the market, where there are 2 supermarkets. Malaba border (8 km away from Tororo): many lodges, but heavy traffic, trucks… not a nice place! On Uganda and Kenya towns.